It was back at the end of the 1980s when I realised that some of the songs I liked were by Queen. My first visual contact with them was through the ‘I Want it All’ clip, which is one of the band’s most powerful videos. Seeing the double bass drum kit and all this liquid (beer) rise up from the floor toms during the video, and the band playing so hard opened something in my heart. The next step was doing chores around the home and getting paid by my parents to have the money to buy Queen cassettes and CDs. My father was a drummer back in the 1960s and I always had his drum kit in the fireplace room at my disposal, so the first thing I did after seeing Roger Taylor smashing his drums like a devil, was to do the same on this smaller 1967 Sonor kit I had at home. This is how I started to play the drums and started to fall in love with the music of Queen. For me ‘Queen II’ was a flashlight, ‘Sheer Heart Attack’ the next one, Roger’s voice gave me warmth, and the guitar chords of his Queen songs were always different to those in the other songs, it got me hooked! The next step was to gain information from my father about the rudiments of drumming. I was officially a Queen fan and a “drummer”. My teenage years had shifted in a new direction, the right direction. After the loss of Freddie and a few years of inactivity by the band members, in 1994 I went to London and signed up as a member of the Queen International Fan Club. I discovered through the fanzines that Roger Taylor would be undertaking his “Happiness?” Tour and, surprisingly, he would be playing several dates in Italy - this was to be a great occasion and one I couldn’t miss. I convinced my busy father to go to Rome and attend the show at the Palladium Theatre with me. At that time there was no internet or much other news about the tour and it was not easy to buy tickets, but we got our hands on a pair by phoning cousins in Rome and we attended for what I still consider the best concert I’ve ever seen - singing Queen songs loudly with other people, crazy like me, was an amazing moment of my life, my life which consists of music, it literally flows in my veins. Roger’s drumming and voice gave me great joy during all my youth. I listen to many different kinds of music; The Beatles, The Who, Soul heroes like James Brown, Aretha Franklin and Otis Redding, Creedence Clearwater Revival to Nirvana, but when Roger sings and plays his music, my heart and my mind spread wide open - all his solo works are brilliant. I attended a gig of Queen + Paul Rodgers 2005 tour, this was also a highlight of my concert going life. In 2011 my life changed drastically. I lost my father in June when he died due to ALS (Amyotrophic Lateral Sclerosis) and I had the unique experience of meeting Roger face to face for the first time after his rehearsals in Guildford for the SAS Band Xmas concert. Roger was extremely kind and generous with his time and stayed chatting outside of the venue with me, my family and another four or five fans even when his car, a Maserati, was waiting there for him. He was gentle and happy to talk with us, without being in hurry, I was very surprised by his humility. He spoke with us, in the cold, for about a quarter of an hour and later during the concert they informed us that he had the flu - I know of less important artists who are more distant with their fans, he is a real gentleman. After this meeting, I had an emotional crash. I was thinking about my father when he took me to Rome to attend Roger’s concert and I had done the same with my son, Diego. That was the turning point for the book about Roger’s drum kits. As a drummer, I decided to replicate a Queen-era kit and chose the Silver Sparkle Ludwig of the ‘The Game’ Tour. I did this by buying all the hardware and the drums piece by piece. I started to write down a data sheet and looking through videos, pictures, catalogues and searching online with other drummers and fans. The first brick in the wall was laid, and the lust for doing it for the other kits kept me going. The next five years were spent collecting all the information on every single kit Roger played live, in the studio or as a guest with other bands. What came out was a monumental “Taylorpedia”. Supported, morally and intellectually, by many friends who are named in the acknowledgements, I got to know Nick Lauro, a nice Mersey drummer, with a blog called www.thedrumdoctor.net, which helped me improve my written English. Roger Takahashi, Joshua Macrae and Crystal Taylor were the key individuals in completing this project. Also, Emma Donoghue of Queen Production helped me, as did Roger’s current Drum Technician Nigel Burchett. Following the help of Crystal, with his huge experience working with Roger, Takahashi, the geek, with his crazy good energy and knowledge of drums and all the information Josh provided, I proceeded to the handover of the draft copy to Roger Taylor. He was incredibly kind to reply to me with a handwritten letter with his compliments. The Cornish drummer also answered, by pen, some questions I included in the folder I sent. The questions and answers appear as an interview in the book. There is also a very interesting interview with Crystal which focuses mainly on the human efforts involved in being a roadie, instead of the “gossip”. The purpose of the book is technical and musical, not commenting on the private lives or about what the band did as rock stars away from the stage. 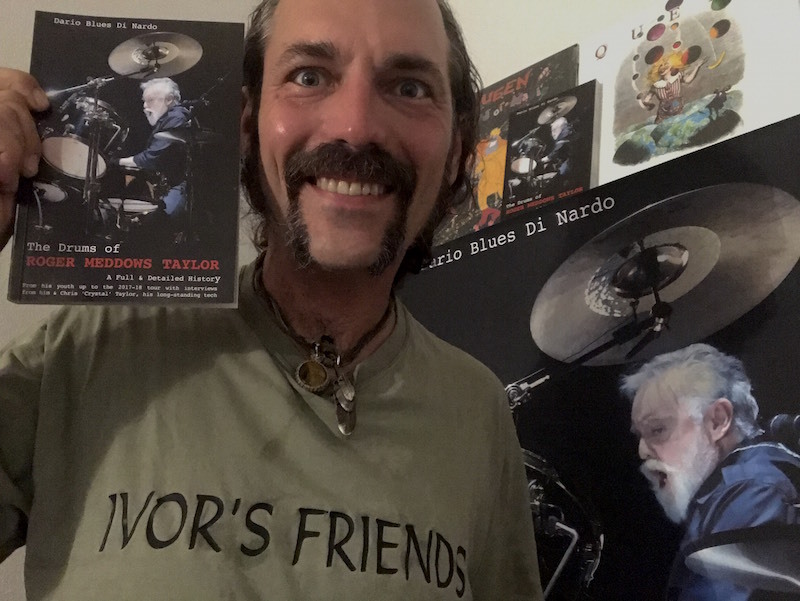 The book is divided into three parts in which every Taylor drum kit or set-up is described, including modifications and hardware details, ranging from his first kit in the 1960’s, up to the last one played in 2018. Between chapters, you will find many new pictures and curiosities, extracts from interviews in which our drumming hero refers to his kits or his playing, details on his snares and drum heads, logos and further information about his work as a solo artist, including collaborations and guest appearances with other artists. One thing you should know if you decide to write a book is that to use pictures and photos you need the permission of the copyright owner, this issue took a lot of time and energy. I spent a year contacting photographers to get the photos in which Roger Taylor’s drum kits were clearly visible, to show the readers the kit being focused on in each chapter. In the end, I collected 170 photos, all received for free; one from Brian May, others from Mick Rock, Queen Productions, Jim Jenkins, Paul Bird and crew members Peter Hince and Brian Zellis, some previously never seen before. Some photos that are included are mine, taken during the Queen + Paul Rodgers Tour in 2005 and others from the 2012 tour with Adam Lambert. To cover the ‘Happiness?’ Tour, I used my father’s pictures, which are all great shots. The cover picture couldn’t have been any other than the one taken by Thilo Rahn…what a superb shot. The back cover is one by my Sicilian friend Giancarlo Calò, another crazy fan. One of the greatest things about the book is that profits go to ALS research and to the Mercury Phoenix Trust - over €2,400 and €1,045 have already been donated respectfully. A book about a drummer of a rock and roll band which directly aids those who need help. Thanks to all the people who supported me, and to all the people who are writing to me with compliments on what I have achieved - Thank You. It’s a big success for me, but most important of all, a big help in the fight against these brutal diseases.